We build tents and backcountry shelters. That’s all we do, and from our first tent in 1973, we have been driven by a single, simple point of reference: define the capabilities of the tent or shelter we envision, then build it with the most advantageous balance of six essential principles for its desired performance. We believe this method of design and construction yields the highest performing backcountry shelter solutions available. To outline a tent’s capabilities, we use our Label categories: Black Label models are all season, all condition tents ideal for any user; Red Label tents are all season models that favor light weight over absolute strength; tents in the Yellow Label group prioritize the lightest weight, and are geared for warmer climates and for use in snow-free times and in more protected conditions; and Blue Label models are individually task specific. Our performance “principles” – the six attributes we consider critical to superior performance – are reliability, adaptability, ease of use, durability, and comfort, all integrated into the optimal synthesis for the intended performance range, at an appropriately low weight. Thus, Black Label models offer the highest level of these qualities. Since lighter weight is given higher priority in the Red and especially in the Yellow Label performance blends, there is some sacrifice of reliability, adaptability, ease of use and so on in these groups. Simply put, you must be able to depend on your Hilleberg tent, whether it’s one of our strongest, Black Label models, or one of our lightest, most minimal Yellow Label ones. We deliberately choose all materials, design elements and construction techniques – outer tent fabrics, pole diameter and guy line placement, for example – to exceed the performance parameters in each Label category. Thomas Lipke and his group rely on their Atlas during a dog sled trip in Svalbard. Photo: Thomas Lipke. 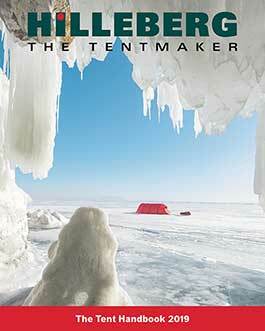 Your Hilleberg tent must perform equally well across the entire spectrum of its Label category performance range. Thus, Black and Red Label tents must be true all season ones. Specifically, Black Label models must be fully functional in both the most and least demanding conditions. Red Label tents must be nearly as adaptable, but with the constraint of their prioritizing lighter weight over absolute strength. Yellow Label tents, designed for warmer environments and for snow free trips in less exposed terrain, must still adapt to hot or cool, rainy or dry, and windy or still conditions. No matter how reliable a backcountry shelter is, if it’s complicated or difficult to put up, it plainly falls short. Every Hilleberg tent features linked inner and outer tents, which provides simultaneous pitching of both as well as the inherent simplicity that allows for simple, straightforward set-up, even in bad weather. For our Black and Red Label models, that means being able to pitch the tents easily, even in high winds and blowing snow, in the dark, alone, and while wearing heavy gloves. Our Yellow Label models, similarly, must be as uncomplicated to set up, by one person, at night, in rainy, blustery conditions as they are in calm ones. Given its performance range of use, your tent must be able to withstand not only the daily rigors of your trips, but it must also last as long as possible. Our Black Label tents are designed and built to offer the greatest durability. Red Label and Yellow Label models are made to give the best durability possible given their lighter weight materials. At the same time, we are very conservative, so we over-test and understate the specifications of all of our tents. Our Black Label tents are designed to maximize durability but also to offer full adaptability and ease of handling in both fine and foul conditions. Here a 30 year old Nammatj stands strong against some truly ugly conditions. Photo: Anders Gustafsson. Comfort in the backcountry is not mere “luxury”; it’s basic “livability.” That’s why all Hilleberg tents are built with bright, spacious interiors and venting solutions that keep air flowing in all weathers. It is also why all our tents have the small details that turn a mere house into a home: well-placed interior gear pockets; clothes lines; and appropriately placed ring and toggle or clip and loop fasteners for open doors or vents. An Unna provides ample space for one paddler and with large, completely coverable mesh doors it can let a cool breeze through the tent. Photo: Peter Gerdehag. Making a reliable, adaptable and easy-to-pitch tent that is heavy doesn’t meet our standards. But neither does creating a tent that is super light at the expense of any of our other criteria. The key to our low weight principle is that we never consider the weight an end in itself, but as the mortar that binds our other criteria together. The development of both our lightweight Kerlon 1200 for Red Label tents and our even lighter Kerlon 1000 for Yellow Label tents produced a number of choices. In both cases, we opted for the ones that best balanced light weight and strength. We could have chosen a lighter fabric, but it simply would not have met our standards. Our ultimate aim is not to make the lightest tents, but, within their performance range, the lightest, strongest, most reliable, dependable, comfortable and durable ones.